Fantastic image. I like the sinister atmosphere and also the composition is brilliant – especially with the shadow. Thank you Rabirius, Dartmoor shadows are all or nothing! Toto, we are not in Kansas anymore!!! I don’t think you got this excellent shot in the big city!!!! :). Happy new year Patti!! You went back home for the holidays? Spooky picture!!! You rock. It’s a wonderfully “spooky” place Tom and yes, “back home” for the holidays. Thank you Tom and all best to you bunkering down in the big blizzard! Where the wind takes us . . . . no Toto, we are not in Kansas anymore but back to the big city soon! Happy New Year best wishes to you Derrick! You are most kind, thank you Angeline! That is a fantastic photo, Patti. And I get the feeling the long walk was a good one. Thank you so much Bente and yes it was a very good walk with so much to explore up there. Great dark tones in this composition, and the expansiveness of the land. No buildings, cars, or other obstacles to contend with, and yet a profound sense of scale. That’s me there, just wandering. Trying to acquire and enjoy as much freedom as possible. There is a profound sense of freedom up there Allan and, perversely enough, the worse the weather the more glorious that sense of freedom. Thank you Meredith! That sunshine was such a treat, follow the golden path! Thrilled to hear, thank you so much for your comment! It is so spectacular up there that it is easy enough, for me, to feel overwhelmed and not quite sure where to point the camera. Am sure you are enjoying your walks up where you are, hope so! Beautiful image, Patti. It’s almost as if the figure is gouging the path out of the land. A wonderful thought, thank you so much Richard! Thank you very much indeed Burgess!! Dartmoor is a magical place! Thank you so much for your kind comment and re-blog! Not long to go now Zita! The person in the picture is a very dear friend and not the Dartmoor Monster!!! 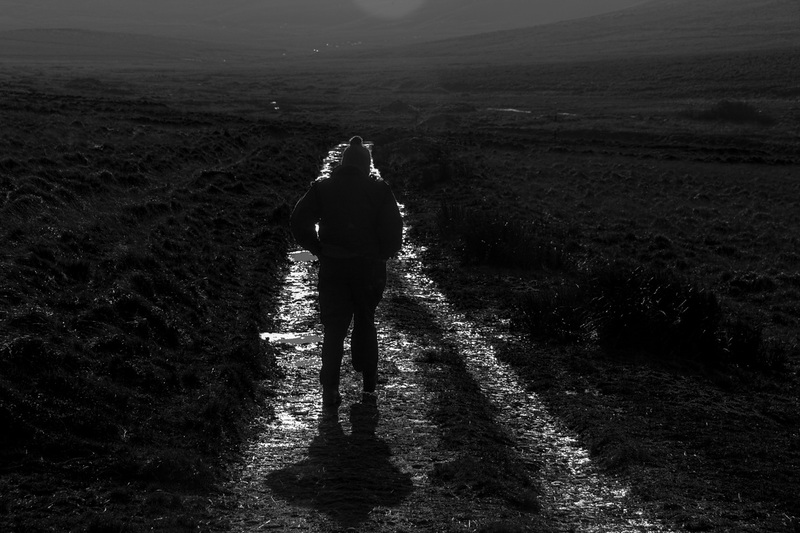 And the Dartmoor Monster walks again !!! Now now, you know that’s not true!!! Uuhh, semms to bei vey wet in the UK. But even better than the tons of snow, isn’t it? So wet Ralf, I think I prefer the snow . . . . and hope your week-end was good fun, or at least dry and warm! Thank you Mike! We have enjoyed dry, warm summer days up there but they seem so long ago now! Lovely shot against the light. Thank you doublewhirler, the light did blaze the trail! And so many Happy New Year wishes to you Joshi! Thank you! nicely done image which reminds me of Eugene Smith’s work. John, thank you so much for the compliment!! Wishing you a wonderful year and I always look forward to seeing more of your great work. Thank you Pat, it was one of those rare days when we had the light on our side! No rain! Yes, fabulous capture of light, texture and atmosphere Patti! The moor has it all, thank you Madhu! Love it, the fading light..I can hear the crunch and slide underfoot.. Thank you Cath, those footsteps write stories all their own don’t they . . .
My grateful thanks to you Sir Pinky! Thank you so much poppytump – one of those lightening moments you think please, please let me get this shot . . . !